Nothing says Christmas in Moose Jaw like the cards along Christmas Card Lane (aka Langdon Crescent). Of course, CCI 100 is there to wish everyone the best of the season. Central Collegiate will mark its 100th year in July 2010 [ July 8-11, 2010 ] with a birthday party and reunion. 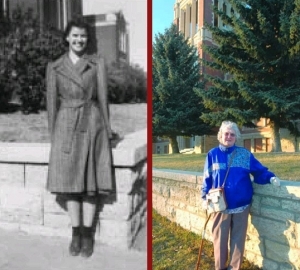 In the first of our profiles on former graduates, the TimesHerald spoke to Moose Jaw resident Marion Tolley. For Marion Tolley, school was an opportunity she grasped with both hands and she knew she was lucky to be learning. Robin Boadway [CCI Graduate Class of 1960 / Rhodes Scholar 1964] says he's humbled by the roster of accomplished Canadians with whom he'll rub shoulders tomorrow in Ottawa. "It's really quite intimidating to be there with them," Boadway said yesterday. There's legendary TV broadcaster Peter Mansbridge, noted philanthropist Stephen Jarislowsky and accomplished pro golfer Mike Weir. 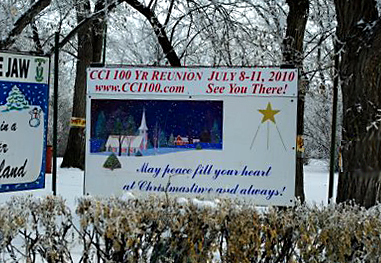 It seems that there are rumours floating about that the CCI 100 Reunion has been cancelled due to lack of interest. Nothing could be further from the truth. As you can see, we are alive and well. We actually had to laugh when we heard this rumour... with the Comittee neck deep in planning meetings it sounds funny to hear something like this pop up in conversation. To quote Mark Twain, "The rumors of my death have been greatly exaggerated". The CCI 100 "Chalkboard" is back! We took it away until we had more people sign onto the Alumni Page. We'd love to give everyone their own space in their profiles but this will have to do... a big board for everyone. You can send greetings, ask questions, tell us about your day... whatever, but please keep it clean. Click to take you to the Chalkboard. Well, it took a while but everyone's profile (all 1900) has been changed to the new graduation year sort method. You can now choose your grad year (or any year) on the CCI Alumni page with a drop down menu and only that year will be listed. We've had all three draws for the beautiful hardcover CCI 100 Reunion Photobooks. 1. Gold Single Ticket - $120 - for one person to enjoy all events for the 4 days of the Reunion. 2. Gold Couple - $240 - 2 Gold Tickets for two people to enjoy all events for the 4 days of the Reunion. Attention Golfers!! Take the poll! We're trying to find out what sort of interest there is for golf. Golf is planned for Thursday at Hillcrest and a Par 3 on Friday. If golf is your thing while at the Reunion please submit your vote on the CCI 100 Poll Page (just below Reunion News). We only need the "Yes" votes so there really isn't a need for any "No" votes. 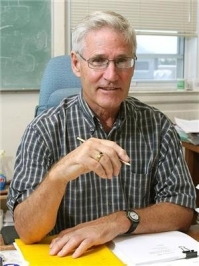 If any of you are wondering why your name has made it to the top of the alumni list on the CCI 100 website it's because we're converting the graduation field data on the website over the next couple of months. The old method allowed you to sort the list by graduation year but it still listed everyone in every year. This meant you still had to search through all of the pages to find your class year.